THE 1st 1.5 Liter stainless steel French Press coffee maker is made from top quality 18/10 stainless steel, both the interior and exterior. It is made to outlast other coffee makers. 3-LAYERED STAINLESS STEEL FILTER STRUCTURE traps the smallest coffee grounds to produce an exceptional, full-bodied flavor. 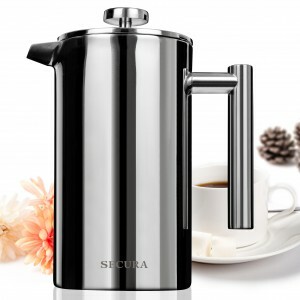 BONUS Stainless Steel Screen included with this French Press coffee press. Filter screen is easy to disassemble and clean. Stacking one or more screens together gives your coffee espresso a more refined taste. This French Press coffee maker comes with our “Cool Touch” handle and knob for comfortable and safe pouring.